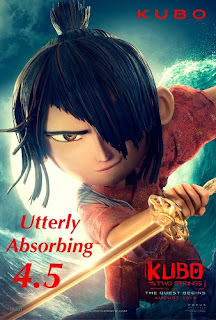 Kubo (Parkinson) a young boy must locate a magical suit of armour worn by his late father in order to defeat a vengeful spirit of the past. So far this year, animated movies for me have been somewhat hit and miss. It started strong with Kung Fu Panda 3 and the equally excellent Zootropolis (Zootopia). Then things took a nose dive with The Angry Birds and very disappointingly The Secret Life of Pets. Things recitified themselves with Finding Dory. With Kubo and the Two Strings I am very happy to report that upward trend is continuing as an animated movie yet again blows away many of it’s live action counterparts. 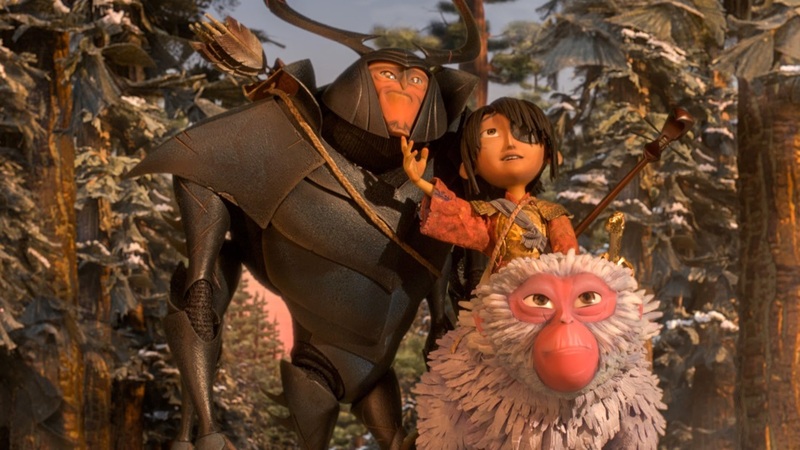 Kubo and the Two Strings is an utterly absorbing, heart wrenchingly unforgettable movie. Kubo is a boy who is looking after his frail mother, he's free though to go to the local village in the day to entertain the villagers with origami fuelled animated stories powered by the magic of his musical instrument. However, by nightfall he must return to their rather spectacularly located home near the coast. However one night, he does not return in time unleashing evil spirits that a hell bent on his destruction. Fortunately the magic of his family summon two animals - Monkey (Charlize Theron), and Beetle (Matthew McConaughey) to protect him on his quest. The animation of Kubo and the Two Strings is stunning. The movie is produced by Laika, known for their stop-motion animation features such Coraline, ParaNorman and The Boxtrolls. Having not seen any of these movies, I must admit it took me a while to get used to the stop-motion nature of the animation having been spoilt on Pixar movies. However once the story starts to click into place and the adventure begins I just became lost in the story. Also, going one further than the animation itself, the way the whole world is realised is beautifully executed and entrancing. Kubo is also not a movie that exists purely for its set pieces (Which when done are organic and exciting) it's more about story and heart. The voice work as well is top notch. Huge credit firstly must go to Art Parkinson who provides the voice of Kubo himself. Charlize Theron is excellent as Monkey, the animal with a hard exterior but a warm heart. Matthew McConaughey though for me was the show stealer as Beetle. Think Buzz Lightyear meets A Bugs Life. He had the movies best lines, he was genuinely funny and a brilliant creation. Ralph Fiennes is also perfectly cast as Moon King the evil spirit on Kubo’s tail. As for the script it is well written. Early on in the movie (Before Monkey and Beetle show up) the script is peppered with humour, but when the central trio start their quest the writing really clicks. ​The movie itself although marketed to kids, is really for older children (11-12 plus). Younger children will probably be scared by some of the visuals and the themes of the movie are generally for an older child/adult audience. The Sisters (Of Kubo’s mom) voiced by Rooney Mara being one such example. They are very creepy. Women with emotionless porcelain masks with huge witch hats eerily floating in pursuit of Kubo. (Very similar to the V for Vendetta look). Before I wrap up my review, I must make special mention of Dario Marianelli, the movies composer. The score and music is superb and really adds to the spectacle of the movie. 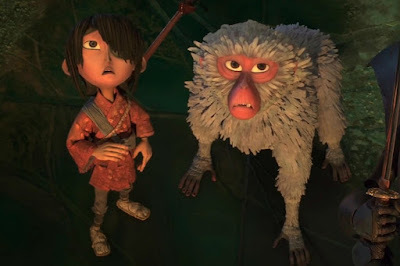 Kubo and the Two Strings is not for everyone and it’s certainly in the category of movies that pass many people by. However if you are looking for an animated movie that is unlike any other, then you will not be disappointed. Kubo and the Two Strings is now on general release in the UK.